The compact and handy 27 piece screwdriver set from Bosch includes all key accessories for screwdriving and fastening jobs in and around the house. Ideal for every DIYer with its clear and colour-coded layout that allows the user to quickly identify each bit. 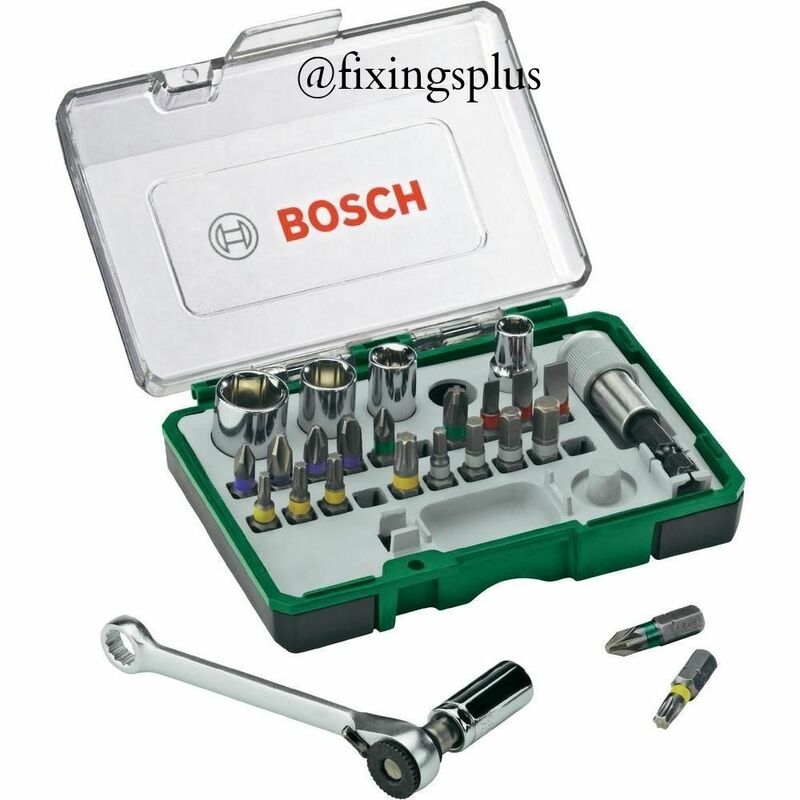 This set offers a variety of screwdriver bits (Philips, Pozidrive, Slotted, Internal Hexagon and Torx) and sockets (1/4" drive key width from 6 to 13mm). The mini ratchet included within the set is perfect for small and common jobs. The quick release bit holder enables the user to change between screwdriver bits effortlessly. The sockets and screwdriver bits along with the quick release bit holder can be used either with a power tool or in conjunction with the mini ratchet. Since its inception in 2004, the name Fixings Plus Ltd has been synonymous with high quality products and excellent service, this has enabled us to become a prominent and respected company within the Fixing and Fastener Construction Industry. At Fixings Plus Ltd we take pride in maintaining a personal service and good working relationship with all of our customers, with helpful advice, technical support and on-site back up service that includes testing and training as and when required.As a major stockist for such manufacturers as ITW, Spit, Paslode, Fischer Fixings and Ejot in our central Birmingham warehouse we can boast large stocks of specialist fixings systems, in particular Pulsa and Paslode gas powered nailing systems as well as a wide range of Hand Tools, Power Tools and accessories. We are able to demonstrate these products amongst others on our very busy, yet friendly trade counter. There is ample car parking space. We accept Paypal as our preferred choice.We accept Credit, Debit cards over the phone (£10.00 Minimum order value) Call 0121 333 7288 ask for Matt.We accept Cash on collection.If you have any problems with anything regarding the products you have purchased please contact us before leaving any negative feedback, We will do our best to resolve any problems you have encountered. Anything purchased from us can be collected Monday to Friday from 9am - 5pm to save on post or delivery charges. Please book before arrivingGoods are dispatched Monday to Friday (Excluding Bank Holidays)We either use Royal Mail, Aspray Couriers, Parcel2go or our own delivery vans to get the goods to you.Please provide a telephone number for your order if its not being delivered by Royal Mail, this helps with any delivery problems we may encounter and ensures goods get delivered on time.Delivery times are an estimate so please be patient as we are in the hands of Royal Mail, delivery companies etc.We obtain a certificate of posting with all Royal Mail Deliveries, Please email for a price if you wish it to be sent recorded at your cost.We deliver to UK only, If you live outside the UK email us for a quote on delivery and we will see what we can do.If you want items delivered to the following postcodes/Areas email us before biding as in some cases extra post/delivery charges may apply ALL BT & ZE POSTCODES IV3-IV40, IV52-IV54 IV63, KW1-KW14, PA20-PA40, PH19-PH40, PH50, ALL WESTERN ISLES, IV41-IV51, IV55-IV56(SKYE), KA27 & KA28, KW15-KW17, PA41-PA78, PH41-PH44 and Off mainland, Scotland Highlands, Jersey and Guernsey, Northern Island, Isle of Man, Isle of Wight, Isle of Scilly.Please note all post charges include packaging, Fees etc, most items are free post. Please pay for any items you purchase within 5 daysAll goods are supplied subject to our standard terms and conditions of sale. A copy is available on request. <!-- end froo seller tabs--> <!-- froo helpful links box -->Helpful LinksAdd to Favourite SellersSign up to NewsletterView FeedbackContact SellerVisit sellers eBay ShopAbout Seller Page<!-- end froo helpful links box --> <!-- froo cross promotion -->More Items!View more great items<!-- end froo cross promotion --> <!-- right custom box --> <!-- froo custom footer custom content --><!-- end froo custom footer content -->Powered by Frooition.comFrooition www.frooition.com | No-js Template | eBay design, eBay store design, eBay shop design, eBay template design, eBay listing design (ver:froo_no_js)This listing is currently undergoing maintenance, we apologise for any inconvenience caused.